Photo: Gilmer Heitman House, ca. 1908, 2581 First Street, Fort Myers, FL. Listed on the National Register of Historic Places in 1996. Photographed by User:Ebyabe (own work), 2010, [cc-by-3.0 (creativecommons.org/licenses/by/3.0)], via Wikimedia Commons, accessed August, 2014. Lee County administrative offices are located at 2115 Second Street, Fort Myers, FL 33901; phone: 239-533-2737. Lee County was organized in 1887. It's population exceeds 550,000. Portions of the text below were adapted from Historic Resources of Lee County, 1881-1950, a Multiple Resource Area [†], listed on the National Register of Historic Places in 1999. Adaptation copyright © 2011, The Gombach Group. Although Lee County has a rich legacy of prehistoric Indian occupation that dates to about 6,500 B.C., recorded permanent settlement of the area did not occur until the mid-19th century. Development of the interior of the state during Florida's early statehood period (1845-1860) largely depended on the ability of the government to convey public lands to private ownership in a way that would benefit the state as a whole. In 1850, the federal government ceded nearly 10 million acres of wetlands, primarily in the southern half of the peninsula, to the state of Florida for the purpose of drainage and reclamation. In 1851, the Florida Legislature created the Internal Improvement Board to manage the newly acquired state lands. Three years later the trustees of the Board recommended that the state government offer large parcels of these lands to private corporations, as an incentive for constructing railroads. In 1855, the legislature created the Internal Improvement Fund to financially assist companies undertaking approved railroad and canal building projects. In the case of railroads, the Board might issue bonds up to $10,000 a mile for the purchase of rails and rolling stock, and for the construction of bridges and trestles, once the railroad grade had been constructed and cross-ties laid. The bonds were a lien on the assets of the companies. Florida's contributions to the Confederacy during the Civil War threw the fund into debt, and state law declared that no land could be sold until the debt was cleared. Throughout the Reconstruction Era, the IITF trustees sought investors who could help clear the debt in return for some of the land the state held. In 1881, Hamilton Disston, a Philadelphia steel magnate and saw manufacturer, negotiated with the IITF for the purchase of 4 million acres of land for $1 million. Known historically as the Disston Purchase, that transaction included an area that ranged from Tarpon Springs south to Fort Myers and west to Lake Tohopekaliga. In addition to his 4 million acres, Disston was granted a franchise to drain lands in the southern interior of the peninsula, for which he would receive half of the reclaimed land. 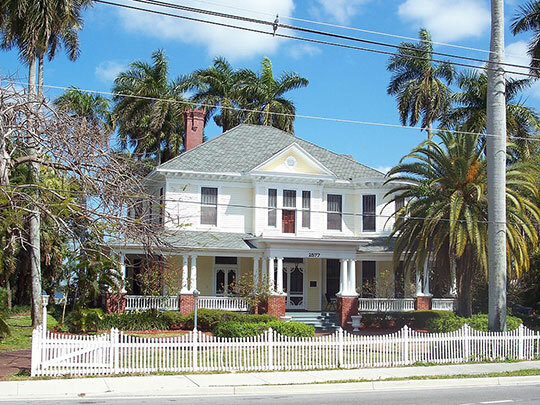 By 1880, a cluster of homesteads had been established around Fort Myers, which had been constructed as an outpost during the Second Seminole War (1835-1841). Because of its location near the mouth of the Caloosahatchee River, Fort Myers was chosen as the Gulf coast outlet in Disston's plan to drain the Everglades Swamp and open a navigable waterway to his headquarters at Kissimmee on Lake Tohopekaliga. To do this, canals were to be dug from the head of the Caloosahatchee to Lakes Bonnet, Hicpochee, and Okeechobee. At the same time, a channel connecting Lakes Tohopekaliga, Cypress, and Kissimmee was to be opened to link with the Kissimmee River, which feeds into Lake Okeechobee. Disston envisioned steam ships descending the Mississippi River, then traveling along the Gulf coast, ascending the Caloosahatchee River into Lake Okeechobee, and continuing up the Kissimmee River to the new Kissimmee City "rising like magic in the wilderness of tropical verdure." The coastal islands of Lee County also experienced a significant amount of settlement during the early 1880s. About twenty homesteads were established on Captiva and Sanibel Islands, while the southern tip of Pine Island was purchased by a group of New York investors, who founded the town of "St. James on the Gulf." By 1886, the group had constructed a hotel, a number of houses, and a 600-foot pier at what is now know as St. James City. The initial settlement of Gasparilla Island began in the late 1870s, and the first subdivision on the island was platted in 1897 by Albert Gilchrist, a Punt Gorda politician who later served as governor of Florida. Settlement of Lee County was dramatically slowed by several events occurring in the late 1880s and early 1890s. A yellow fever epidemic broke out in Key West in the summer of 1887. Ports along the Gulf coast, including those in Lee County, immediately established quarantine regulations that refused entry to ships from Key West and Tampa. Although the quarantine was lifted in November of the same year, the damage to the tourist trade in Lee County was significant. Many visitors who had annually spent their winters in Fort Myers stayed home that year, and some never came again. Another setback that occurred was the gradual dissipation of the Disston Empire. Beginning in the late 1880s, Disston had trouble convincing state officials that his dredging and canal building operations were progressing satisfactorily. The state asserted that the company's claims to the amount of land supposedly drained were greatly exaggerated. In an 1888 compromise, Disston agreed to resume dredging some areas, a process that was largely completed by the mid-1890s. The work, however, resulted in no appreciable land reclamation, and the waterways he intended to open for navigation were impassable to all but small, shallow-draft vessels. Disston's dream of Fort Myers as a bustling "gateway to the Gulf was never realized. Lee County's second period of development was ignited by the expansion of its citrus industry. Before the two statewide freezes, the cultivation of citrus formed only a relatively small part of the county's economic base. The world-wide demand for Florida oranges and grapefruit soon began to outstrip the available supply and prices rose dramatically. The owners of existing groves redoubled their efforts in caring for their trees and planted new ones on any available land. The profitability of citrus growing began to attract outside investment, causing Lee County grove lands to sell at double or triple their pre-freeze value. Citrus production in the Caloosahatchee region increased rapidly through the remainder of the decade. The number of boxes of fruit shipped from the county rose from 15,000 in 1896 to over 75,000 during the winter of 1899-1900. By 1919, the annual income from the county's citrus products was well over one million dollars. Lee County's participation in the land boom [1919-1927] was delayed due to its inadequate road system. The road building programs of the 1910s, left unfinished by the advent of World War I, resumed in the early 1920s. The Tamiami Trail was completed to Punta Gorda in June 1921, but stalled there while supporters lobbied Lee County officials to vote the necessary funds for its extension to Fort Myers. The roadway was finally opened in March 1924, after the completion of the bridge spanning the Caloosahatchee River at East Fort Myers. That improvement, together with the extension of the marl-surfaced Dixie Highway from Olga to Arcadia in 1922, enabled Lee County to join the frenzied land speculation activity that was already fully underway in other areas of the state. The increasing evidence that Southwest Florida was about to experience unprecedented growth led to a movement by residents in the southern part of Lee County to call for the creation of a new county. The primary force behind the breakaway movement was Barren Collier, who had acquired about a million acres of land in the south of the county. Collier's promise to personally fund construction of the Tamiami Trail through his property was a key element in persuading the Florida Legislature to approve the creation of Collier and Hendry Counties from portions of Lee County in July 1923. † Stephen Olausen, Sherry Piland and Carl Shiver, Florida Bureau of Historic Preservation, Historic Resources of Lee County, 1881-1950, nomination document, 1999, National Park Service, National Register of Historic Places, Washington, D.C.